There are many important factors that go into observing the weather and making forecasts, but one of the most vital is barometric pressure. Barometric pressure is read with barometers. 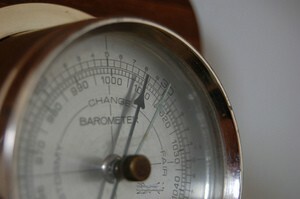 A barometer measures how much air pressure there is. Why is knowing air pressure important? Because air pressure both dictates what kind of weather is going on and also can be used to predict what type of weather may be soon coming. Before going into the basics of how barometers works, it’s helpful to understand why reading barometers matters in the first place. As you just found out a moment ago, air pressure is important because it affects weather. Air pressure is generally divided into 2 categories: high pressure and low pressure. High pressure is a sign of fair weather. Low pressure is associated with storms. When a barometer indicates rising air pressure, then weather is improving — it’s getting better, so to speak. The reading on the barometer also rises. When a barometer shows pressure is dropping, that usually means weather is getting worse — storms may be on the way, if they are not here already. The reading on the barometer falls. These variances in air pressure are responsible for all sorts of weather, including wind. Barometric readings are commonly given out in inches and also in millibars; a millibar is simply a metric conversion of barometric pressure readings. You’ll hear references to both inches and millibars, though you’ll probably hear the term millibars used more frequently by weather people. If you pay much attention to the weather forecast on any news program, you’ll have likely heard mention of barometric pressure as it relates especially to tropical weather and arctic weather. Some of the coldest weather experienced comes from very cold areas of high pressure. Tropical storms and hurricanes are areas of low pressure. In fact, some of the strongest hurricanes ever recorded had extremely low air pressure readings — among the lowest on record! You may not experience such extreme weather where you live, but you’ll still see a barometer change its readings as rain and storms approach (lower barometric readings) or as cooler weather advances and sets in (higher readings). Standard barometric reading at sea level is 29.92 inches or 1013 millibars. Who Invented The Barometer — And How Do Barometers Work? The barometer is a 17th-century invention. Evangelista Torricelli invented the mercury barometer around 1644. The mercury in the barometer rises in a long, vacuumed glass tube. The mercury typically hovers between 28 and 30 inches high in the tube, with variations in the height of the mercury based on the air pressure. About 200 years later, in 1843, Lucien Vidie modified on Torricelli’s barometer by inventing a barometer that does not need mercury. Instead, the aneroid barometer that Vidie made uses changes in the size of a metal cell made of beryllium copper or phosphor bronze to indicate barometric pressure. Aneroid barometers are the kind we typically use today; they are safer (no mercury) and less expensive. You commonly see aneroid barometers hanging on walls. You probably have seen an aneroid barometer hanging in a restaurant with nautical or marine theming. Aneroid barometers are also found in some homes.